Is the St James Hotel Haunted? 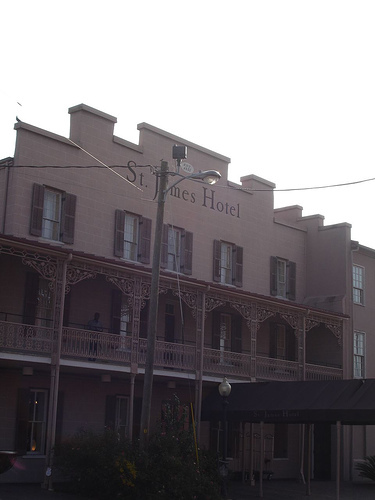 The St James Hotel was built in 1837 and is the only antebellum riverfront hotel that is still left in Selma. It was know as the Brantly Hotel for its first 50 years and was saved from being burnt down during the American civil war by the union army. During its past, some of its owners rented out rooms long term, which wasn't uncommon at the time, because of this it is said to of been the headquarters of the infamous Frank and Jesse James. In 1892, the hotel closed down for over 100 years due to area hardships before re-opening again as a hotel, and it still stands to this day as one. Many psychics and paranormal investigators have visited the hotel since it's re-opening and it has been classed as definitely haunted. Its most famous haunting is said to be that of Jesse James himself, who appears in various rooms around the hotel as well as at one of the tables to the left of the bar. Another commonly seen apparition is of a women who has been named as Lucinda, she is thought to be possibly that of Jesse James girlfriend, She appears as a tall dark-haired women dressed in an early 1800's gown. Another popular paranormal event at the St James hotel is the sound of a barking dog, which can be heard quite frequently in the courtyard, many guests have complained about the barking, but an actual dog can never be found. Other reports include seeing various apparitions appear wearing the typical style of dress common with the early 1800's all over the hotel, especially in the courtyard. As well as objects moving by themselves and various sounds such as footsteps and banging, but the source of these noises can never be identified.